Have you start wondering lately "what if my child is an EMO "? Or asking yourself "how should I approach my emo teen"? Are you looking at your kid and feel that lately something have been changed with your sweet child that you knew before? You've start noticing the lack of communication, no more shared moments together, no secrets, no best friends anymore?Does your child start wearing strange clothing style, has long fringe covering her/ his beautiful eyes, start putting dark make-up, be accessorized with Gothic symbols, listening to different music and become less sociable? Even if it may sound weird, but to be part of an Emo group or movement, it makes her/ him feel that belongs to her/ his friends, and also helps to be different than others, and reconfirm the fact that is a unique and special person. And sometimes, the critiques got from you or from people around could be wanted and somehow expected, even if she/ he does not recognize this, cause for a teenager, any kind of attitude, including negative reactions, is better than indifference. Are these few signs that your child is turning to "Emo" and you should be worried about or is just a fashion style that soon will fade away? So, are you a parent with Emo children ? Are you asking yourself my child is an Emo or not? What shall I do to accept, understand and protect her/ him? We hear so often lately in mass media about a sort of trend amongst young people - Emo kids, emo makeup, emo style, emo music - they are all characteristics of a newly developed lifestyle quite similar to the hippie style from 70'. 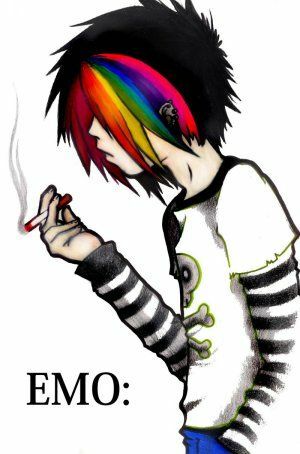 The word "emo" comes actually from "emotional" and is mainly used for describing a musical trend from the United States. 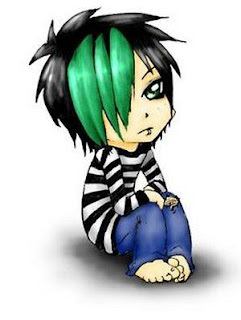 Emo started from listening to a type of music called emo-music , then was complemented by wearing dark clothes, skinny jeans, androgynous makeup around the eyes (smoky eyes), piercings, and hairstyles that covers almost the entire front face and head. The real reason for concern is not the fashion style or music, but the sadness and moody behavior adopted by teenagers. They look depressed, "broke" in front of the entire world and sometimes seems to encourage suicidal attempts, and for this reason parents, friends and teachers should be aware of and do their best to protect and motivate the kid with positive thinking, love, joy and happiness. First of all, do not forget that sometimes parents omit to consider their child's feelings, are not really listening to what the kids have to say, and often are not accepting them even when they're trying to correct so said odd behavior. Even if you notice some changes in your child do remember to listen to her/ him first, and... that you have been like her/ him at your youth, as well. Remember that for you, too, your friends' opinion was more important than your parents or close relatives, and the last ones were not always totally agreeing with your choices or decisions at that time. Think a bit at what you wouldn't wished your parents to tell you then and do not step on same paths with your own children. So, do not become over protective or suffocate them with your presence or worries - this cannot be totally avoided when you care but can be applied in a smart way! Try to be more open, watch them from afar, and soon you'll see that you'll win again their trust. Then, little by little, when they'll confide again in you, you may find out what is motivating them for such believes, which is the psychological need behind their behavior, and the drive to be part of that group - the need to be accepted, the need to get upfront, anything to prove? When you win your child's trust and you're able to handle things as good as possible, you can talk to her/ him, show your appreciation and love, tell her/ him how much you appreciate the courage to be different, help her/ him to see things from a new angle and get a different perception. All it takes is good communication and understand the fact that each one of you belong to different generations, and your kid has to learn, adapt and survive into her/ his (new) world (present and future), not yours (past and present). Even if your kid's new fashion style (clothing, make up, hair cut) looks strange to you and you disagree with her/ his type of music or friends look and behavior, better try to calm down without express yourself upfront, while adopting a "cool" approach. Many psychological studies are stating that whenever you disapprove their boundaries to a certain group/ movement, that will become even more attractive or addictive to one individual, while you should maintain a protective attitude and be supportive. So, first of all you shall do your best to understand your child. At first sight, whatever she/ he might doing lately could sound weird to you and quite revolting, but if you have time and patience to discuss about it and find out more about your child's desire to be(come) a part of such group, and what means this for her/ him, everything could show to you from a different perspective, and you may realize that is nothing so bad as it seemed on the beginning. You may be surprised even more understanding that you have common believes, values, desires and dreams, the only difference being the generations "distance" and chosen paths to achieve things in life - new era, new fashion, different aspect and approach. It's all about understanding, love and communication! 2. When you should interfere and when is the time to take real action? If you keep a close eye on your teen and notice that this "Emo stage" is only for a while, and are no other serious effects (for example: using bad words, unsafe sexual relationships, taking drugs, cheating, stealing, robbing, drinking alcohol or else), and feel that you can count on her/ him and trust further, give her/ him some space and let behave as pleased. When there's no (more) pressure from you, you may be surprised to see that your kid will soon decide on her/ his own whether or not to continue, or to renounce such attitudes. They will further decide whether the group they've chosen is suitable for her/ him. In case you see that things are getting worse and you've lost communication, you may ask for specialized consultancy (medical care and therapists, special programs offered in schools, etc). If you notice that his environment drowns her/ him down and you have concrete reasons, ask her/ his (new) friends/ group to let her/ him alone, and you still see no difference and recovery, then you shall ask for authorities assistance. This is a very sensitive issue, so, be brave, play smart and everything will be just fine! In today's popular culture, being emo is just as cool as being a beatnik was in the 1960s. Emo culture revolves around music, knowing your emotional landscape and not being afraid to flaunt it, not to mention having great hair. The following are a few steps to get you emo. Always keep a close contact with your child! Never let her/ him feel lonely, misunderstood or abused. Make common plans, share activities and moments, show your love, talk to her/ him like with another mature person, treat her/ him nicely and as an equal, and it should be a long term win-win cause.